Construction at 130 William Street is two floors from topping out over the Financial District. 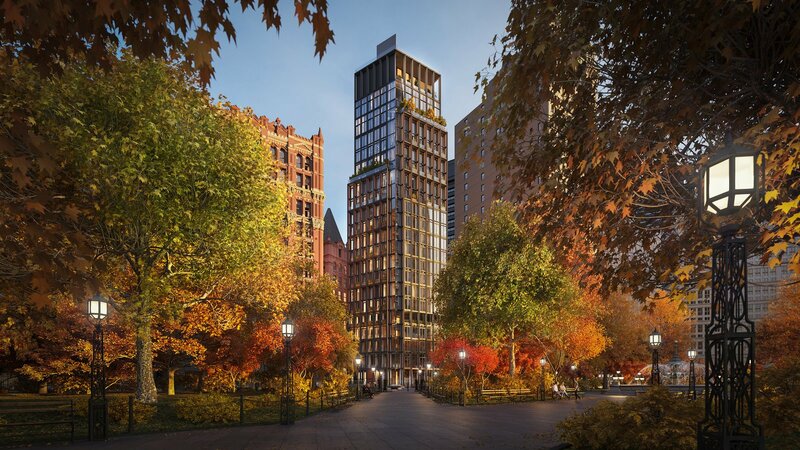 The upcoming condominium tower is the first project in New York City by Sir David Adjaye of Adjaye Associates. Hill West Architects is the architect of record while Lightstone Group is the developer. The 66-story development will rise 800 feet tall and yield 244 units marketed by Corcoran Sunshine. Construction at One Seaport, aka 161 Maiden Lane, has been noticeably paused for the past several months. The 60-story reinforced concrete structure topped-out back in early September, and it was unclear until recently why further progress had halted. 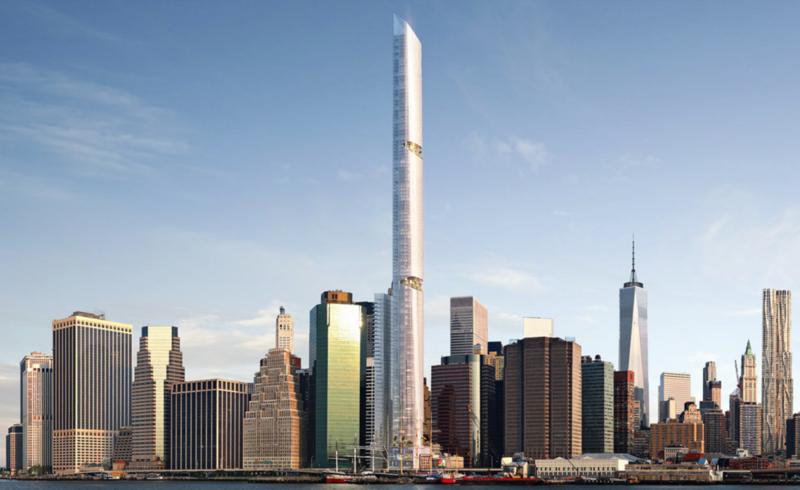 However, new reports have revealed the 670-foot-tall building is actually leaning three inches to the north, leading to a series of legal disputes between Fortis Property Group, LLC, the developer, and Pizzarotti LLC, the current contractor. The project is being designed by Hill West Architects while Groves & Co is serving as the interior designer. Douglas Elliman is handling sales of the units. 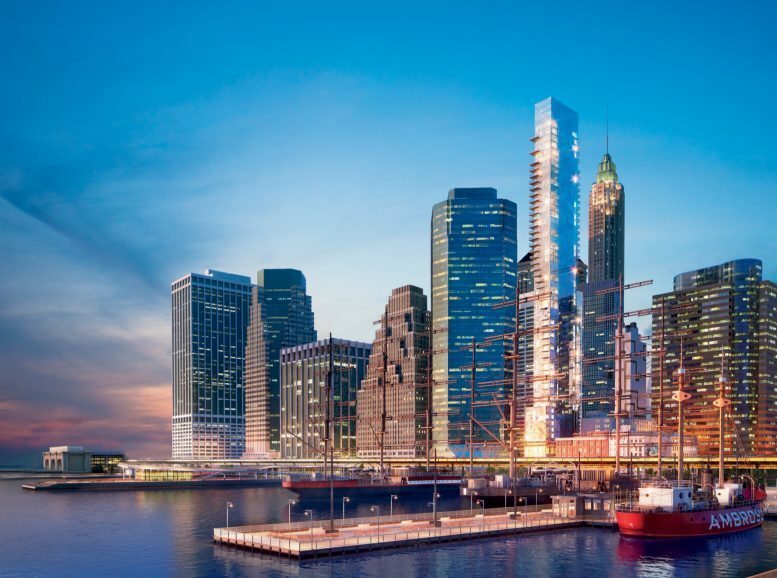 Among New York City supertalls expected to rise as part of the current development boom, 80 South Street has been the only major project of prominence to retain near-complete secrecy when it comes to architectural visualizations. Today, YIMBY has the exclusive reveal for the plan tentatively in the works for the site, for developer China Oceanwide Holdings, which would result in the tallest building by roof height in all of Lower Manhattan, likely approaching 1,500 feet above street level. The first exterior curtain wall panels have been spotted on the western elevation of 77 Greenwich Street. 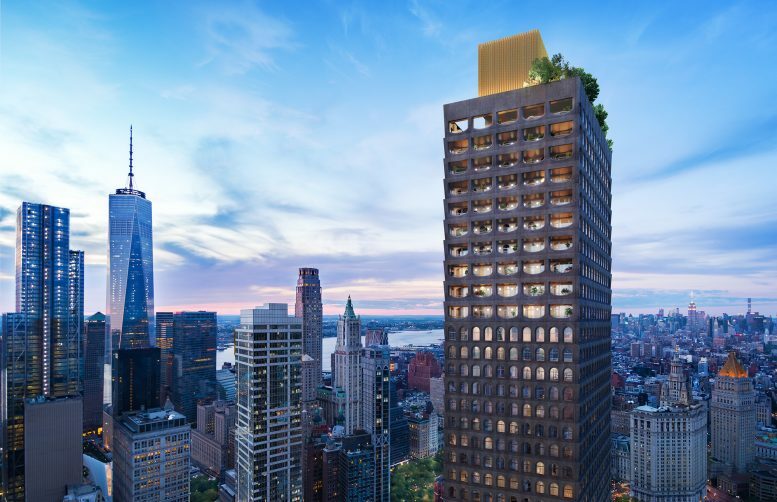 The upcoming 42-story, mixed-use residential skyscraper is located in the Financial District and is being designed by FXCollaborative and developed by Trinity Place Holdings, with interior design by Deborah Berke Partners. Work on One Beekman Street, aka “Pearl on the Park,” is another step closer to completion, as the dark-colored steel frame that will sit in between the floor-to-ceiling windows has begun to go up. This will accentuate the upcoming 25-story apartment building and lend it a more distinctive and detailed appearance. The project is being designed by Rogers Stirk Harbour + Partners while Urban Muse is the developer. 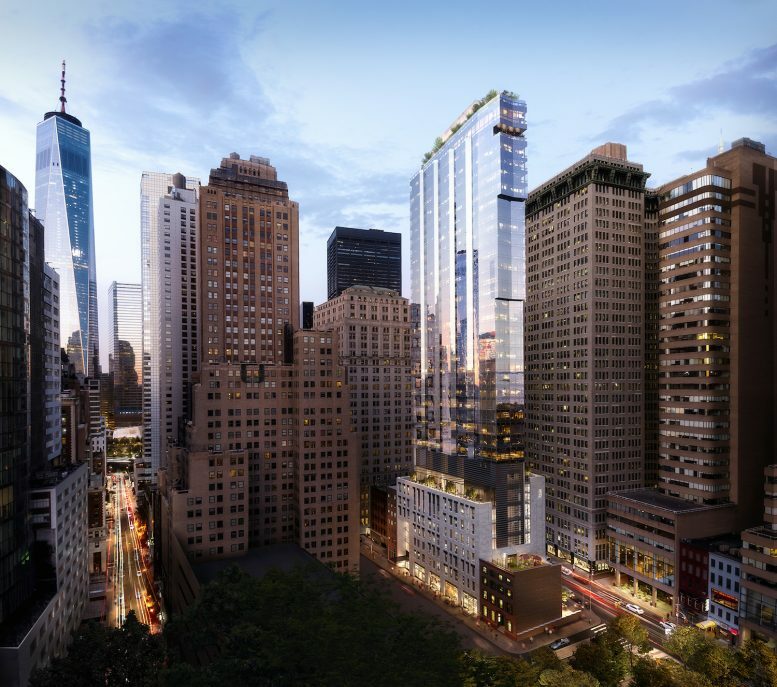 There will be 31 units inside the 331-foot-tall tower with views overlooking City Hall Park. This will be Richard Rogers’ first residential project in New York City.